This article outlines the key dates and early life of Sir Frank Small; it draws on documentary sources and oral testimony. It also then seeks to show by a detailed perusal of newspaper cuttings from the Nottingham Evening Post how that early life informed his later success. Frank Small was born on Friday 3rd July 1903, at Hawthorn Cottage, Nottingham Road, Woodborough (but in the Parish of Lambley). The date and place are confirmed by his birth certificate. His parents were Austin Small (1876-1953) & Sarah Small née Wright (circa 1871-1957). They and their three children moved from their address at Hawthorn Cottage to 29 Shelt Hill Woodborough in 1918 and Frank’s parents continued to live there until 1957. Frank had two sisters, Clarice and Winifred, both living at, firstly, Hawthorn Cottage and then at 29, Shelt Hill. In 1965 he became chairman of the Parliamentary and General Purposes Committee. He was chairman of the Local Government Finance Committee from 1963-65 and vice-chairman of the Agricultural Committee from 1959-60. Alderman Small served as a member of the Local Government Reorganisation Sub-Committee, concerned with new conditions that had evolved since 1957. He has represented his county authority as a member of joint negotiating committees relating to salaries and conditions of service of various employees. A knighthood for Alderman Frank Small: vice-chairman and former chairman of Nottinghamshire County Council was announced in the Queen’s Birthday Honours announced 10th June 1967. Alderman Sir Frank Small, vice-chairman and former chairman of Nottinghamshire County Council, was knighted at a special investiture at Buckingham Palace. Sir Frank was highly respected in local government circles and has been praised for his outstanding work by Conservatives as well as his own Labour colleagues. He was first elected to the County Council for the Byron Division in 1946 and 11 years later became an Alderman. He was vice-chairman in February 1963, and chairman the following May. Born in Woodborough, he went to the village school until he was twelve, when he left to work on the land. Dedicated: Alderman Sir Frank has won himself the highest possible reputation for his dedication to people through local government. He was associated with the County Council for 26 years and was Finance Committee chairman for 12 years. Sir Frank ordered to rest. 1967: Acting on medical advice, Alderman Sir Frank Small, vice chairman of Nottinghamshire County Council, has cancelled all remaining engagements for this year. He will be staying at home in Woodborough and has been advised by his doctor not to receive visitors or telephone calls until the New Year. “He is not seriously ill, but a recent internal infection has added to the physical strain of fulfilling his numerous commitments. Those closest to Sir Frank know of his tremendous courage and also of his reluctance to withdraw even temporarily from public life, in which his advice and experience are in constant demand. He is making good progress but only by his taking a complete rest can we be sure that he enters 1968 with his customary vigour”. Sir Frank Small not standing again: Labour stalwart of Nottinghamshire County Council, Alderman Sir Frank Small, who will not stand for re-election to the new Council. Sir Frank, one of the best known and most respected personalities in the East Midlands, was elected in 1946 and became an alderman 11 years later. He received the CBE in 1962 and was knighted in 1967. Frank attended Woodborough Woods Foundation School on Lingwood Lane until he was twelve; he then left to work on the land. 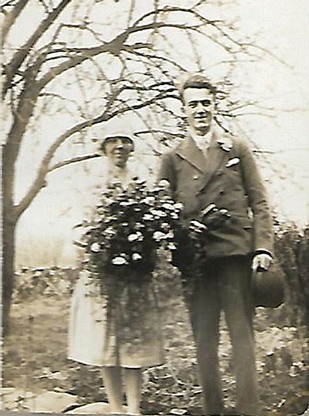 He married Sarah Ann Foster at the Wesleyan Chapel, Woodborough on Saturday 22nd December 1928; both date and place are confirmed by their marriage certificate. Sarah was born in 1901 at Field Cottage in Woodborough which is located at the end of Field Lane; the property still stands today. At the time of his wedding Frank was a surgical hosiery worker and lived at Shelt Hill; Sarah lived with her parents and siblings at Field Cottage, Woodborough. The 1931 Electoral register shows Frank and Sarah living in a rented house on Richardson’s Square. It had been known until the 1881 census as Johnson’s Square. From the 1901 census it was known as Richardson’s Square. It still exists: a row of cottages at right angles to Main Street behind what was Pittwood’s shop. It is thought Frank and Sarah moved from Richardson’s Square to The Homestead sometime in or just before 1939, renting the rear, north-facing part of that property. We know from the 1939 Register (taken because it was known that the War would preclude a full census in 1941) that Frank and Sarah were then at The Homestead; further, a 1940 Assent describes Frank as being in occupation at that time. The Homestead was once owned by William Lee, a builder from Birmingham who died in 1920. He stated, whilst writing his memoirs just before his death, “They appear to have commenced their married life at Woodborough the old home of the Lee family, where family tradition tells us that the first stocking frame was invented by one William Lee in the year 1589”. He appears to be referring to his grandfather John Lee of Lowdham who married Fanny Hind of Gonalston. Around this period, Frank started his market-garden business, growing potatoes, brussel sprouts, spring cabbage and lettuce but in later years his view was that to survive “you specialise or you perish” so he abandoned the growing of potatoes. Frank Small gave a lecture to Nottingham Textile Society in 1959; during this he stated that he bought The Homestead in 1946. This is exactly as shown by the Conveyance to him of that year. 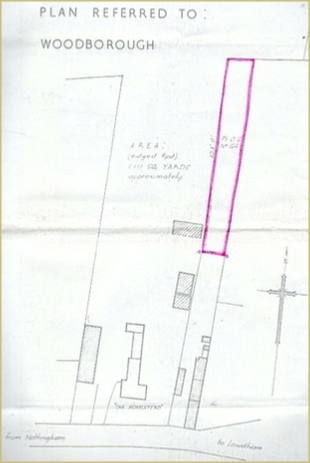 In 1959, Frank bought 1,111 square yards of land that lie directly behind the next-door house known as Spring Cottage (See plan taken from the Deeds dated 1959 left) thus adding to land already belonging to The Homestead. In 1969 he sold certain parts of his land lying to the north of The Homestead to Arthur Clower, a builder. being readied for market, and right, the house with barns. By the time of his death in April 1973, Frank had been knighted. His widow, Lady Small, died a few of months later, in September of that year. Land opposite The Homestead, amounting to 11.53 acres and with a Main Street frontage of approximately 236 feet, was sold by auction on 17th October 1974 to Costains, the builders who constructed Smalls Croft and its offshoots. Right: Annie & Harold Hill in The Homestead’s yard with their milk van. Below left & right: Yellow, brown, green & red areas depict the land that was sold in 1974, hatched areas were not part of the sale that took place on 17th October 1974. Pound for pound: Although Woodborough Woods Foundation School is a Church of England establishment, and Sir Frank is a Methodist – and one who is doing more than his share towards Anglican-Methodist unity. The new school is still in debt to the tune of £2000 and a busy calendar of events has been arranged until the end of the year to raise half that total – which should in fact, clear the debt, because Sir Frank has promised to meet pound for pound up to a total of £1000, all money raised for the appeal fund before the end of this year. What pleases Sir Frank particularly is that the opening of the new school on Lingwood Lane marks a success in his campaign for school playing fields to be available to all “without padlocks on the gates at the end of term”. Old Head’s new note: Yesterday was a day of wonderful memories for one of Nottinghamshire’s “elder statesman” Alderman Sir Frank Small, former chairman of Nottinghamshire County Council and Woodborough’s senior citizen. Old Head’s new note: Yesterday was a day of wonderful memories for one of Nottinghamshire’s “elder statesman” Alderman Sir Frank Small, former chairman of Nottinghamshire County Council and Woodborough’s senior citizen. He attended the official opening of the new Woodborough Woods Foundation School and there met his old headmaster, 83 year old Mr Archer Saunders, who taught at Woodborough for more than 34 years. The new school has made Alderman Small feel intensely proud. For it replaces the one at which he received his only formal education – a total of six years’ instruction, which ended when he left at the age of 12. He went on to educate himself and become chairman of the County Finance Committee before becoming chairman of the Council. Surprise: As he said at yesterday’s opening ceremony, the school was built on playing fields owned by the parish council, but the County Council, who are responsible for providing the site, compensated the parish for the loss of ground and provided new playing fields which will be available for all at all times. The County Council will maintain them. Mr Saunders had a small surprise for Sir Frank. He showed him an entry he made in his diary when he retired 20 years ago. He had recorded Sir Frank’s birth date, the date he started school and the date he left. “Why”, asked Sir Frank, “Did you do that?”, “Because”, replied his old headmaster, “I thought you would go to the top”. He excelled as the county’s “Chancellor of the Exchequer” and will go down as the architect of Nottinghamshire’s victory in the battle with the city who wanted to take surrounding urban councils into a Greater Nottingham scheme. He will also go down in local authority history as the main-spring in the CLASP building system which the county pioneered. A keen cricketer: Alderman Small is a director of the National Building Agency, and his interests embrace a whole scope of community life. He was a director of Nottingham Playhouse; a member of the East Midlands Airport joint committee, and a vice-president of Nottinghamshire County Football Club and Nottinghamshire County Cricket Club. He was himself a keen cricketer, playing for Epperstone until an accident involving a runaway horse ended his career prematurely. The only son of a framework knitter, he has been a Methodist local preacher for 38 years, although this side of his activities is not widely known. He received frequent calls to preach. He has represented the county on the County Council’s association since 1955 and is a voting member of the executive committee. Ald. Small (63) a farmer, with a smallholding in Woodborough, received a CBE 1962. A year later he became Deputy Lieutenant of Nottinghamshire, having been appointed a Justice of the Peace in 1952. On this occasion here in the grounds of The Homestead in 1962 Frank Small with his wife Sarah before leaving for London to receive his CBE. (Commander of the British Empire medal). 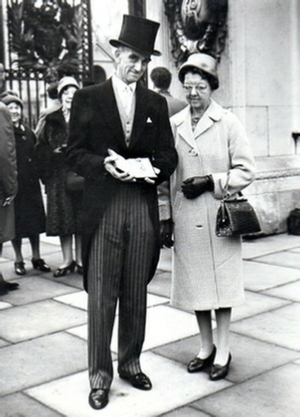 Outside Buckingham Palace in 1967 Sir Frank and Lady Small following his knighthood. Sir Frank died at his home on 18th April 1973: I have written and spoken to a number of tributes to him and it is interesting that people afterwards add further to my picture with the remembrance of many things he did which were characteristic of him, showing the personal side of the man, his regard for people, his thoughtfulness and courtesy. The official records list a remarkable achievement, a wide range of interests and a list of high awards, but it is perhaps this other, more personal side which means more to us in the village. The packed chapel was itself a significant tribute by us all. The Minster memorial service drew civic officials from a wide area and again it was clear that men thought well of this man. As church men we are proud that he was well known as one; for his concern for the ‘life of society’ has been a central theme of Methodist doctrine. As a village we are proud that Woodborough is identified with Sir Frank. The village was part of his life; it gave him his early and only schooling, his first work on the machines and then his great chance of working on the land of his own. His business ability gave him freedom to follow his administrative flair and the rest of the story is known. It would be intriguing to work out how the village as a whole benefits in some way from the honour that comes to one of its sons. He will be missed at various levels of the County’s life and certainly his regular presence at Chapel focused for us our responsibility to nourish and pray for such people who carry responsibility themselves. We share the loss of Lady Small and also her pride in a man widely recognised as a leader of vision and principle. His funeral service was held at Woodborough Methodist Chapel on 24th April 1973, following which his body was cremated. On the 17th May 1973 a Memorial Service at Southwell Minster was held for Alderman Sir Frank Small, CBE., DL., JP., Vice-chairman of Nottinghamshire County Council. Lady Small née Foster also belonged to this area. She was born in 1901 and was one of ten children of an agricultural worker. Sarah died in 1973 only four months after her husband. She had survived the shock of his death and the upheaval of moving to a new home and planning new arrangements but her health, never very good, failed her just as it was hoped that she might have come through to a time of rest and recuperation. Various editions of the Nottingham Evening Post. Indeed there are documents that show that members of the Lee family owned The Homestead for over one hundred years before Frank and Sarah became the owners. The Lee family might well have had property on the site going back several centuries. It is thought that the majority of the current property was built around 1710 and at which time it would have had a thatched roof. Herbert Bish, a farmer, & Emma Bish, his wife, were living in the front, south-facing part of The Homestead at the time that the Smalls moved into the northern part. Herbert Bish died on 21st December 1946 aged 86 and his wife Emma died a month later on 24th January 1947 aged 84, whilst both were at Bulwell Hospital. At about that time the front part of The Homestead became occupied by Harold Hill and his wife, Annie (née Foster). Frank’s wife, Sarah Small, and Annie Hill were sisters. Harold Hill was in the army from 1942 until 1946, where after the Hills ran a milk round business from their home at The Homestead. But in about the early/1950’s, there came a time when Frank Small felt that the house and yard were not big enough for the carrying on of two businesses. He was by then successfully engaged in his market gardening. So Harold and Annie bought “Woodview”, a former frame knitting factory on Shelt Hill, and moved there. The contents of the table above has been taken from the National Censuses and shows the principal occupants of those years. Note 1: It should be remembered that the last census was taken in 1911 and the 1921 is due to be released in 2021. Note 2: There are some inconsistencies year of birth and ages at census day. Note 3: It seems the Wrights and the Smalls lived together for a time in Hawthorn Cottage. Note 4: Hawthorn Cottage has a Woodborough address but is in the Lambley Parish.